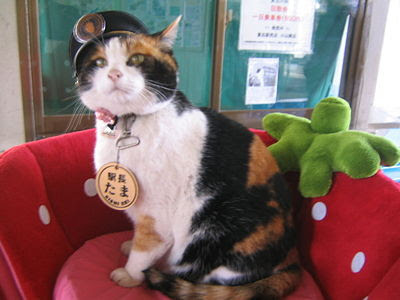 Delta's Dark Den of Destruction: Tama the Cat is a Japanese Stationmaster! TOKYO (AP) — A money-losing Japanese train company has found the purr-fect pet mascot to draw crowds and bring back business — tabby Tama. All the 9-year-old female cat does is sit by the entrance of Kishi Station in western Japan, wearing a black uniform cap and posing for photos for the tourists who are now flocking in droves from across the nation. Tama has been doing such a good job of raising revenue for the troubled Kishikawa train line that she was recently promoted to "super-station-master." "She never complains, even though passengers touch her all over the place. She is an amazing cat. She has patience and charisma," Wakayama Electric Railway Co. spokeswoman Yoshiko Yamaki told The Associated Press Monday. "She is the perfect station master." Appointing a cat to turn around fortunes makes cultural sense in Japan, where cats are considered good luck and are believed to bring in business. Tama even has a Wikipedia article on herself!